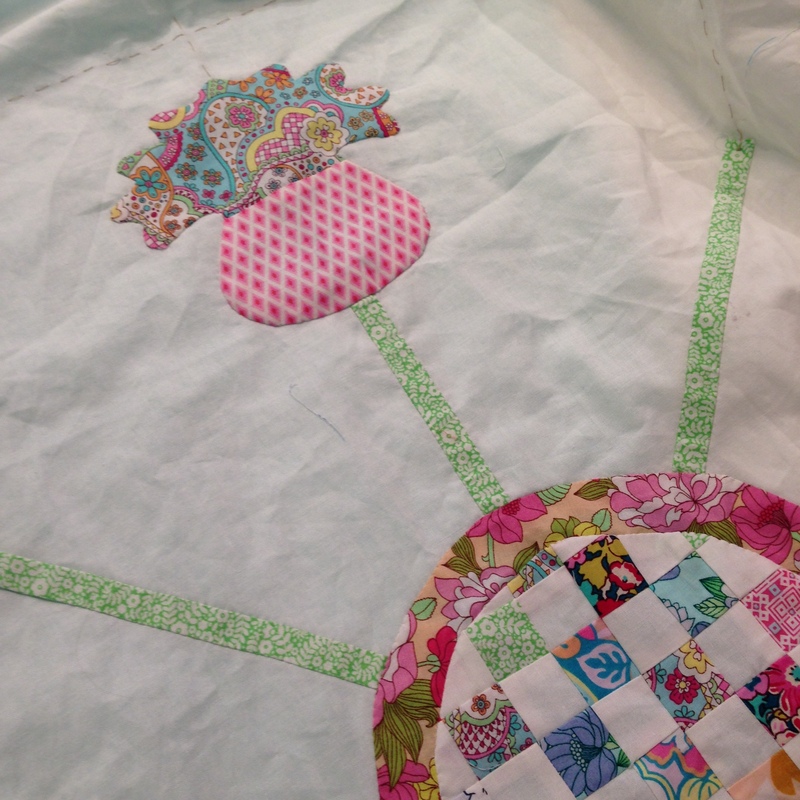 Lots of pictures to show you from my Thistle Thicket hand applique classes. Ginny finished hers FIRST. Yay Ginny! She used a group of Liberty fabrics and a touch of Tula Pink pink 🙂 for hers. 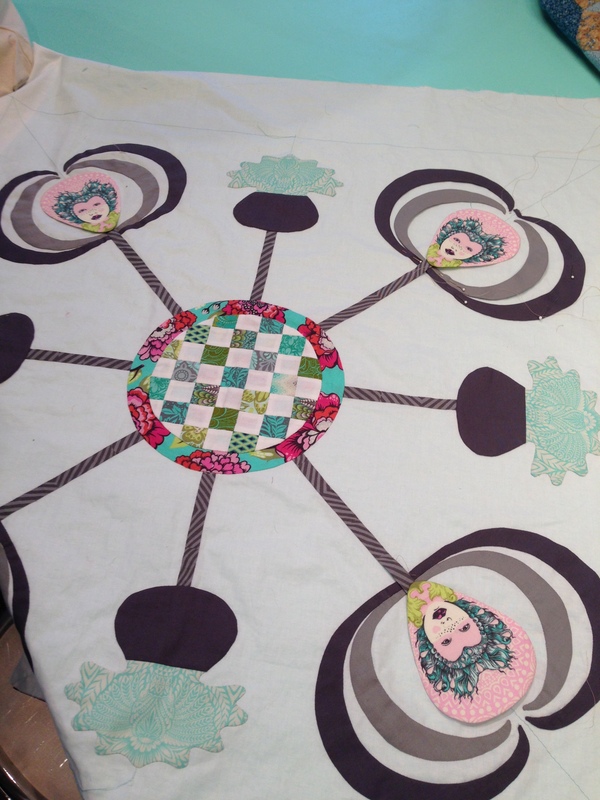 It’s ready for the quilter! Here it was just last Sunday during our class. Check out that blue leaf placement. 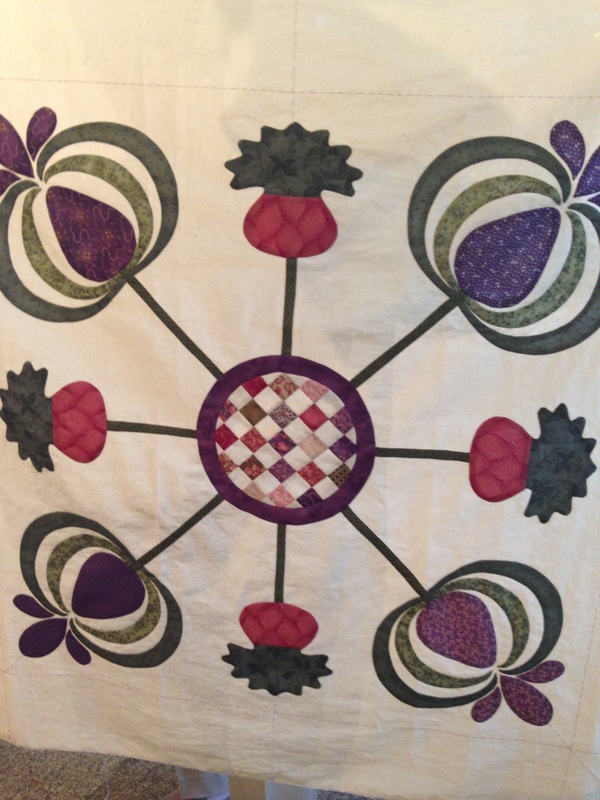 Here’s Beverly’s TThicket using flax Essex linen for the background and Liberty fabrics for the applique. It feels wonderful. Here’s a close up of Bev’s from a previous class. Here’s Bev’s second Thistle Thicket center. 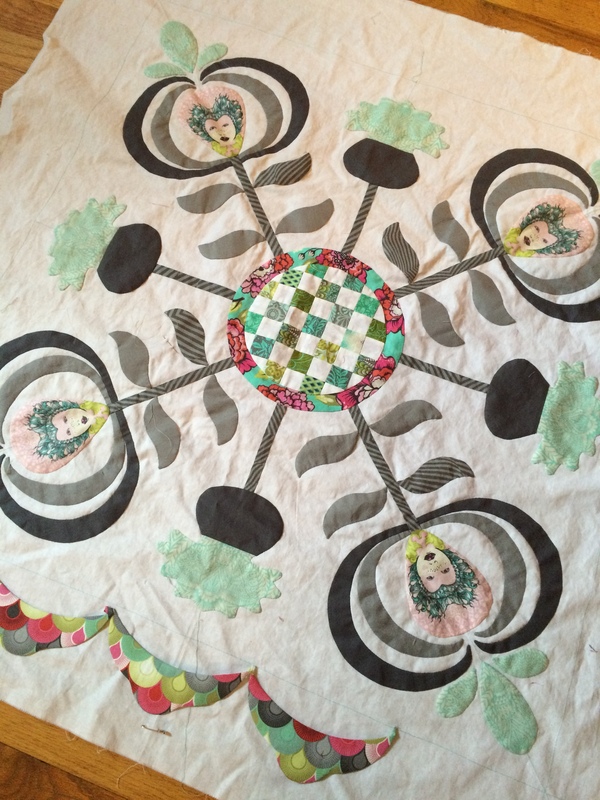 Yep, same quilter, just a different quilt. How fun is that?? Here’s Linda S’s progress. My oh my. We marveled at this one. Fowler’s center. She’s using a collection of Amy Butler on a pale yellow background. Very Fowler. Cydney’s “Elizabeth.” She has started her swags. That gray is pretty fabulous. Here’s an earlier shot of Cydney’s. Here are some more shots from other classes. Mary Ann’s center. She’s using a new Joel Dewberry. Here’s a shot of her border print. 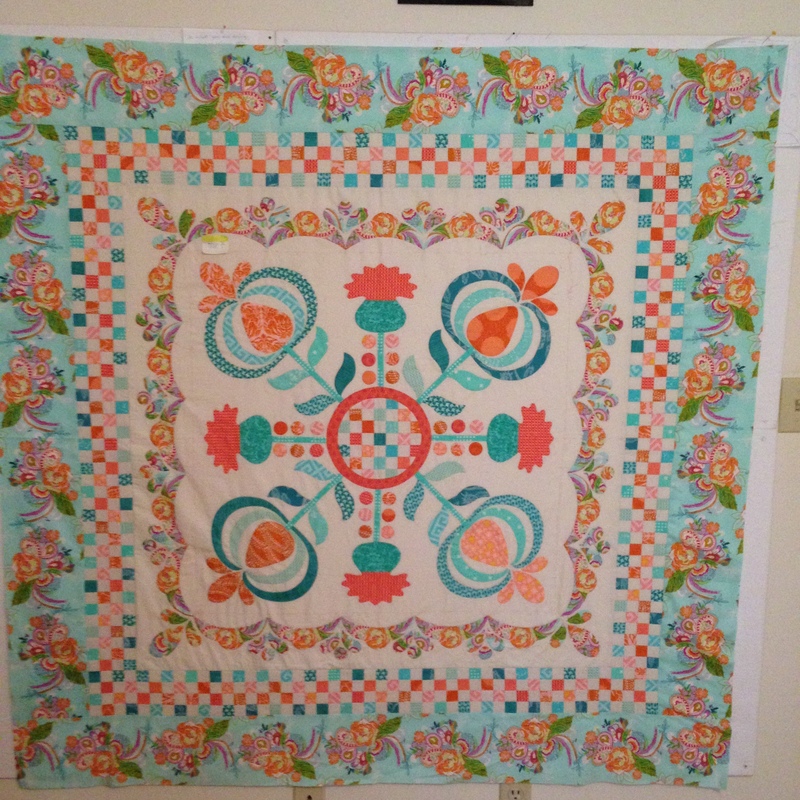 Ann’s second quilt. (What can I say? I inspire people to make more than one 🙂 She used Moda Grunge for her background. It’s not showing up here but it glows. She’ll use Alison Glass for her border. Fab. Deb’s center. Wow. 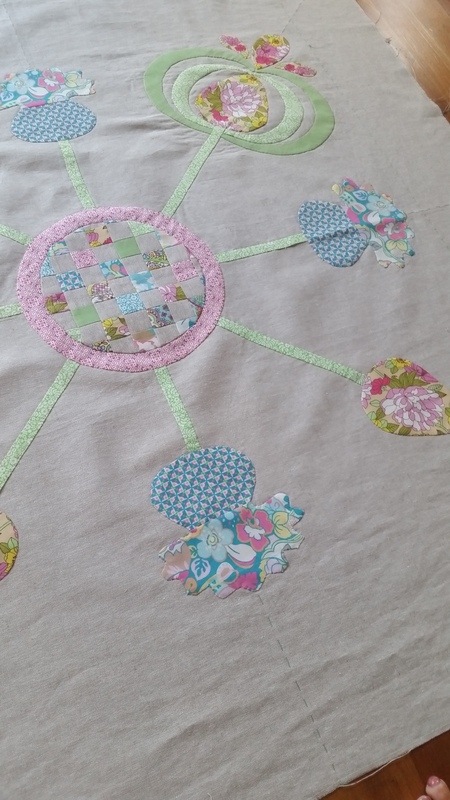 She’s using a diagonal set for her patchwork center. 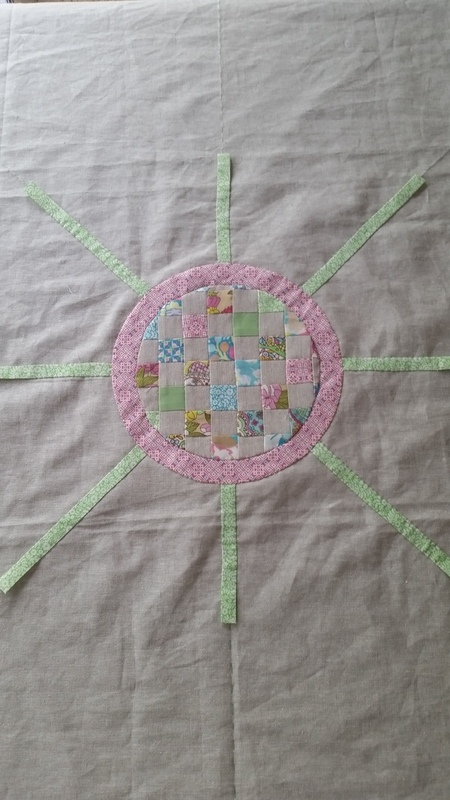 Deb reverse appliqued the outer ring. Brilliant. She’s also the student who taught me about dangling threads. See that silk thread? When she places her next piece of applique, she will thread her needle with that thread and finish stitching. No need to tie off or start over. Genius. Sandra is making a quilt for her son. Don’t tell him. Here’s her border fabric. She has a muted collection. It is going to be wonderful. Paula’s start. I LOVE THIS. Her patchwork border. She forgot to bring her outer border but trust me. It’s gorgeous. I’ll show it to you next time. That’s all for now! A new session of Thistle Thicket will start in January. Think about joining us! 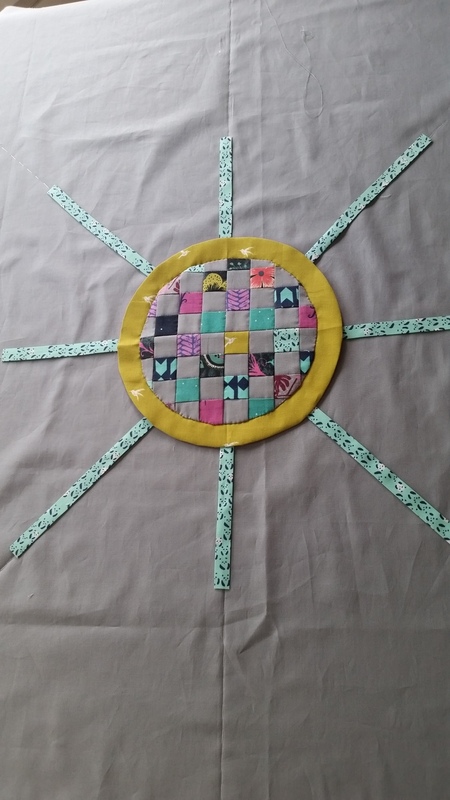 This entry was posted in Uncategorized and tagged applique, block of the month, Kim Diehl, Thistle Thicket on October 28, 2015 by kathleenbaden.